If you read music on a music stand, the OH-27 Music Stand Lamp is a must have. The super bright 10 LED lamp features a 3-way power button located on the base to control high/low/off without accidentally changing the light's position, textured rubber pads provide a non-slip clamp on your music stand, and a flexible gooseneck allows you to aim the light where you need it. It comes with an extra-long 12 foot cord and an AC power adapter. It can also run on 3 AA batteries (included). With the included carrying bag, you have a superior, portable music stand lamp which will light 3 pages of music. 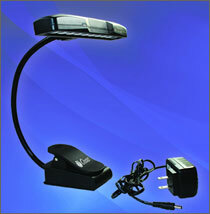 Purchase an OH-27 Music Stand Lamp today for only $29.95 – includes free shipping.